Meet Tony, the angry garden gnome - ready to stand up and fight for what he believes in! 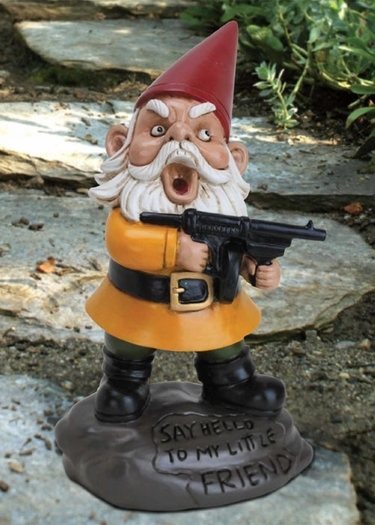 Wielding his machine gun in psychotic manner, it's easy to see why they call him the Scarface Gnome! For protecting your property of zombie gnomes, and more of a gag gift that anything else, this humorous Scarface Gnome will be loved by all Scarface Movie fans and more. The rock that he stands on reads the infamous line, "Say Hello to my Little Friend."